Modular Home Prices: How Much Will My Modular Home Cost? Find out how much modular homes really cost to build. 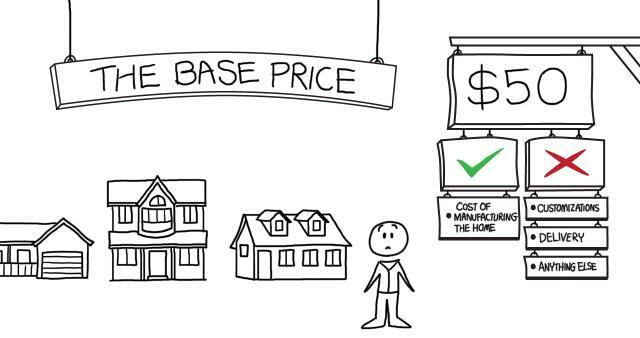 Watch our informative video on price per square foot costs for a prefab home. When asking how much a modular home will cost to build, many different sources will give you many different answers. Some companies will tell you that they can build you a home for as low as $35 per square foot, but what they are quoting you is only the base price. When talking about the cost of a modular home there are a few different terms used to distinguish which price you’re referring to. Always make sure to ask specific questions so you will know which price is being discussed. Any dollar amounts we give on this page are estimates based off of the best information we have available. Your actual costs can and will be different depending on what and where you’re building. Check out our Price Breakdown Page to see exactly where all your money is going. The Base Price only includes the cost of manufacturing the modules for the base plan that you have selected. No customizations or alterations will be taken into consideration with this modular homes price. Some companies will artificially reduce the base price of the home by listing space like an unfinished attic as part of the total square footage. While you can usually turn that space into livable area, that cost is not included in the base price. Average Price: $50 per sq. ft. 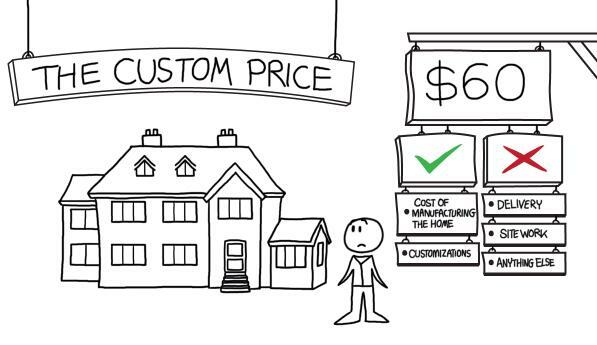 When you actually have a home that you might want to live in with appropriate finishes and any upgrades you may want (including separate structures such as garages), this is now known as your Custom Price. This still only includes the work done by the manufacturer at the factory. Average Price: $60 per sq. ft.
A manufacturer may say something like “You’re looking at around $200,000 to have the home built and set up.” There are a few half-truths in that claim. 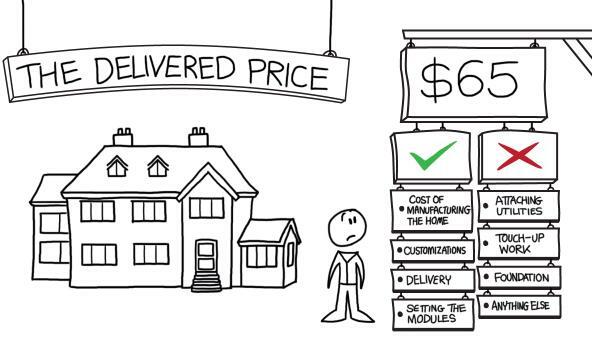 First, this price may or may not include the cost of delivering the modules to your build site. This cost can vary wildly depending on how far away your build site is from the factory, and in extreme cases the cost can run in to 5 digits. When the manufacturer says “set up,” what you may hear is “finish.” This is not what they mean. They said “set up” because they are only talking about setting the modules on the foundation and securing them. This includes fastening the modules to each other and attaching roofs and dormers, but will not include any additional roofing work, attaching utilities, or even the cost of building the foundation that the house must be set on. Since delivery cost is the largest unknown in this situation, ask if they have delivered to your area before and deduce a ballpark number from what it cost before. Average Price: $65 per sq. ft. This is the highest price that your manufacturer will be able to give you any help with. It includes everything the previous prices do in addition to the estimated costs for site prep, pouring the foundation, buttoning up, and any site work like constructing porches. Since all of those aspects are handled by your GC or builder, this price is highly dependent on the costs that they quote you. Average Price: $110 per sq. ft. 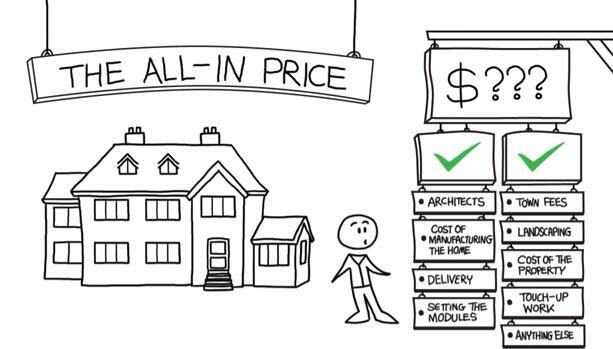 The All-in price is the total cost of building your home. It includes everything the previous prices do in addition to costs for connecting utilities, purchasing land, site work, landscaping, paving a driveway, permits, taxes, fees, etc. There is no way to determine what this cost will be without doing some serious research into your specific situation. Enlist the help of your manufacturer, GC, real estate agent, town hall, and local utilities company. So why do these prices have such a huge gap in estimated modular home price? Check out our Price Breakdown Page to see exactly where all that money is going. And how exactly will you pay for all of this? With a modular home mortgage of course!